Rebecca Lange - Norwex Independent Sales Consultant: Veggie & Fruit Scrub Cloth works! Veggie & Fruit Scrub Cloth works! Just a quick note to show you just how effective the Norwex Veggie and Fruit Scrub Cloth really is when it comes to peeling veggies. My kids, for some odd reason, don't really care for zucchini if the skin is on it; however, without the skin they have no problems with eating zucchini. As we all know, it is the height of zucchini season at the farmer's market, so we've been eating a LOT of zucchini lately. 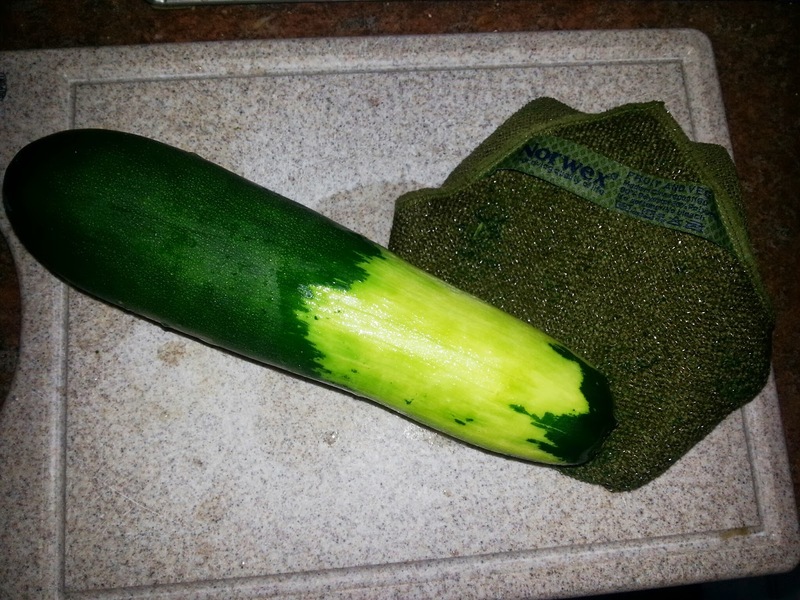 It took me approximately 20 seconds to peel the top half of this gigantic zucchini with the rough side of the Veggie and Fruit Scrub Cloth before I sliced it for our dinner last night. The Veggie & Fruit Scrub Cloth not only removes the dirt and debris from the outside of fruits and veggies, but it also removes the outer wax coating that can harbor bacteria, fungi, and viruses. This cloth is one of my favorite Norwex products! I use it for all of our fruits and vegetables, to smooth, polish, shine, peel, and of course, clean them before we eat! Norwex is for kids too!